Letter from Dave Shoemaker of MIT to LP RE: writes about a letter from Bernard Lewis asking for a recommendation on Bob Smith. Asks what the situation is on the zeta phase as well as whether Bob Smith has published any work on the problem and what the status of the ammonium manganimolybdate is. [Letter from LP to Prof. Shoemaker February 10, 1953, letter from LP to Prof. Shoemaker April 13, 1953] [Filed under LP Correspondence: Box #363, Folder #3: File (Shoemaker, David & Clara 1947-1995)]. I am glad to have your letter of 10 February. I am sure that you had a good time in India - I shall wait until I get to Cambridge, in about six weeks to ask you about it. I am glad that Bragg and Cochran feel that it will be all right for us to attack the problem of the structure of some of the simple substances related to nucleic acids. Corey and I shall remember not to work on the phosphates of adenosine. Corey and I agree, however, that the best substances for us to attack are the deoxyribonucleotides, as you recommend. We should like very much to have samples of the 3' and 5' phosphates of thymidine and deoxycitidine, and then later, if you are successful with the corresponding substances from deoxyadenosine and deoxyguanosine we should like to have them. I think that we shall be able to put a post-doctorate man onto the study of these substances as soon as they arrive. We hope to have about three post-doctoral people working on these problems by fall. Each investigation is a big job, but I think that it will be worth while to carry out several of these structure determinations. I shall look forward to seeing you and Alison early in April. Letter from Ralph Freud, Committee on Public Ceremonies, University of California to LP RE: Happy to hear that LP will be attending the March 20, 1953 ceremony. 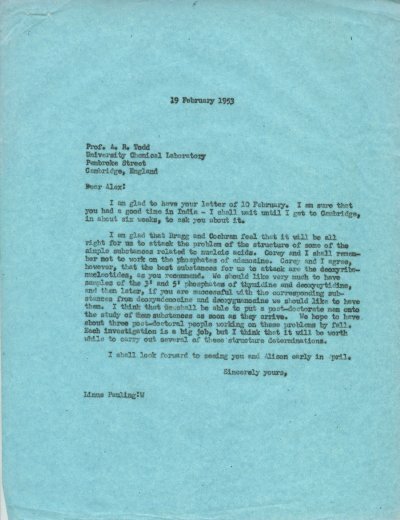 [Letter in reply from LP to Freud February 27, 1953]. [Filed under LP Science: 14.011, Folder 11.2].